Want a mind-blowing experience? The Galápagos Islands—with the help of Charles Darwin—revolutionized scientific thinking and changed the world’s view on long-held beliefs. If they could do that to the world, just imagine what they can do to you! And to help you have that mind-blowing experience, Monograms will handle the details and make it easy for you! On this 8-day vacation, we’ve arranged your hotel reservations, sightseeing, and meals (daily breakfast, four lunches, and four dinners). You’ll also have the services of a Monograms Local Host®, a local who is there for you in Quito to ensure your vacation runs smoothly and is everything you want it to be. Plus, on this vacation, a special feature is your stay at the award-winning Finch Bay Eco Hotel on Santa Cruz Island in the Galápagos, offering a private, seaside location, kayaking, snorkeling, bicycling, and boat excursions to the various Galápagos Islands. Your vacation begins in Quito, where your Local Host will welcome you and provide a set of materials to help you get settled. The next morning, after an included breakfast, we’ll pick you up at your selected hotel for a private sightseeing tour with a local expert, someone who will share insider stories and make sure you see the must-see attractions, including Independence Square and the Basilica of San Francisco Plaza Church. Then you’re off to the Galápagos Islands, where sea lions, marine iguanas, blue-footed boobies, frigate birds, tortoises, and more await you. 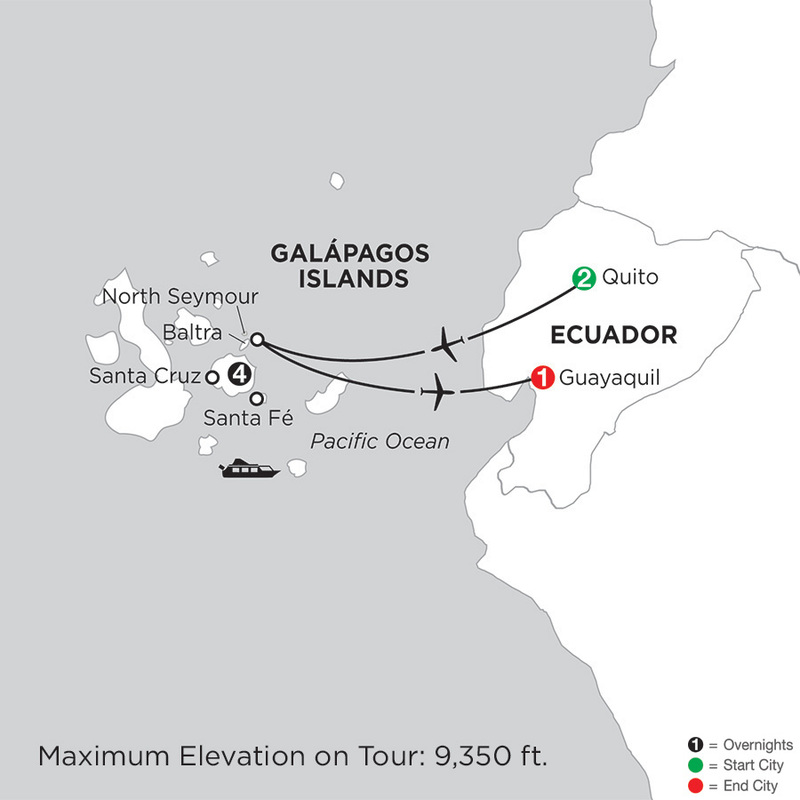 Visit North Seymour Island, with the largest nesting site of the “magnificent frigate birds” in the Galápagos; the highlands of Santa Cruz, where tortoises can be seen grazing in the wild and where you’ll visit a local coffee, sugar cane, and cocoa bean farm; Santa Fé Island, where you’ll see California sea lions and a large species of land iguanas; Divine Bay on Santa Cruz, where we’ll keep an eye out for sea turtles, reef sharks, rays, blue-footed boobies, marine iguanas, and more; the Charles Darwin Research Station, established to conserve the natural habitats and protect the famous giant tortoises; and the Twin Pit Craters, geological depressions of volcanic material where Scalesia trees, ferns, orchids, and mosses can be seen. And don’t forget, throughout your stay you’ll be accompanied by Naturalists, experts who know the native flora and fauna and who help make the experience magical. Don’t forget your Monograms vacation includes arranged sightseeing and transfers! Think about all the time you save and the headaches you avoid and you’ve got yourself the perfect vacation! Your Galápagos package includes daily excursions in the archipelago, including an excursion to Santa Fé Island, where sea lions reside on the sandy, white beach. Here, be sure to look for the large land iguana that can only be found on this island. Your included PRIVATE CITY TOUR showcases the rich legacy left by the Incas and the Spaniards. See Independence Square, dominated by its formidable cathedral, San Francisco Plaza Church, and the BASILICA with its marvelous stained-glass windows. Fly to Baltra in the Galápagos. Upon arrival, board a yacht bound for NORTH SEYMOUR, an island teeming with life. You might have to give way to a passing sea lion, marine iguana, or blue-footed boobies that nest here. As you walk along the shore, see large flocks of pelicans in a dive-bomb feeding-frenzy, and one of the Galápagos’ largest nesting sites of the magnificent frigatebird. In the bushes you can see the males up close with their puffed-up scarlet throat sacs. Return to the yacht and continue to the Finch Bay Hotel. Transfer to the lush highlands of SANTA CRUZ to a farming area called El Manzanillo on the edge of the GIANT TORTOISE RESERVE. Here, tortoises can be seen grazing year-round, along with woodpecker finches, mockingbirds, and flycatchers. After lunch, visit a LOCAL FARM, where coffee, sugar cane, and cocoa beans are grown, harvested, and prepared. Return to the hotel and perhaps spend time on the private beach. Today’s adventure takes you to wildlife-rich DIVINE BAY on Santa Cruz Island. Marine iguanas, herons, noddy terns, blue-footed boobies, and tropicbirds are commonly seen here. You may explore by boat, or if you’re more adventurous, you can take to the sea by kayak. Keep an eye out for sea turtles, rays, and reef sharks as you cruise the tranquil waters. Return to the hotel for lunch, followed by an afternoon visit to the CHARLES DARWIN RESEARCH STATION, established to help conserve the Galápagos’ natural habitats and protect the area’s famous giant tortoises.